Flash is laser focused on helping our customers rapidly grow and win through optimizing our existing services while developing new ones. For example, expanding our services to include in-country screen, test and repair has proven to add tremendous savings and value for our customers. The ability to conduct business in Brazil presents tremendous opportunity for growth for global technology companies; however, doing business in Brazil does bring with it a plethora of challenges. Overcoming those challenges is why, over the past ten years, many of the world’s top technology companies and emerging startups have turned to Flash Global for after-sales supply chain solutions, including spare parts management and trade compliance expertise. As one of the few companies in the service supply chain space that is both an authorized service center and Importer of Record/Exporter of Record in Brazil, Flash Global is ready to build on this decade of success and take it even further. Meeting those expectations will not be easy, but given the ten years of success to date, the Flash Global team is poised to succeed. Currently the world’s eighth-largest economy, Brazil offers tremendous opportunities for business growth in high-tech verticals — and a daunting list of challenges to overcome. The economic and political landscape is turbulent. Taxes and duties on imports and exports are extensive, and the country’s customs regulations and processes are among the most stringent in the world. All these variables combined can leave companies feeling timid and confused about expanding business into the country. 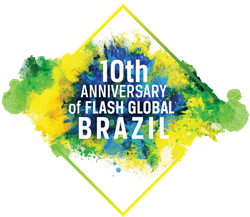 Flash Global’s success in Brazil is rooted in its team of local experts who are involved in every aspect of the operation — from solution design to implementation to go-live — following rigorous processes to ensure excellent results. They track and trace every shipment (using FlashTrac) from Flash’s global service center and distribution center in São Paulo to forward stocking locations in Brazil and throughout Latin America. Those efforts are supported by a dedicated group of customer service- oriented professionals who are well-versed in Brazil’s unique compliance rules, Nota Fiscal process, and structure for taxation and duties. “Reaching the 10-year milestone is an incredible achievement in the evolution of our company. Walter essentially started the Brazil business from the ground up and has built a robust, reliable and customer-centric operation in Brazil and throughout LATAM. The team works very well together and truly cares about each other and our customers. This has created a tremendous competitive advantage for Flash and all of our customers doing business in this region,” Flash Global President and CEO Sam Mikles, said. Headquartered in New Jersey, Flash Global designs and implements end-to-end service supply chain strategies for rapidly expanding companies, including many of the world’s top high-tech original equipment manufacturers. Through its unique Simplicity of One approach — one comprehensive suite of integrated services, a single point of contact and one contract — Flash creates custom solutions that enable companies to efficiently scale in countries all around the world. Companies leverage in-region and in-country expertise throughout Flash’s worldwide infrastructure of global service centers, distribution centers and forward stocking locations to seamlessly move products across international borders and serve their customer bases. To learn more about Flash Global, visit http://www.flashglobal.com.